Over the years, Bryant Park has grown an out-sized influence over the neighborhood around us. Aside from neighborhood building names paying homage to the park, we were thrilled last year to see the MTA had extended the natural themes of the park in the subway concourse below 6th Ave in the form of an art exhibit. It looks like this is another trend that's here to stay as the MTA Arts & Design Department has replaced last year's flower exhibit with a new photo exhibit featuring a window into a surreal natural environment called Park Windows. 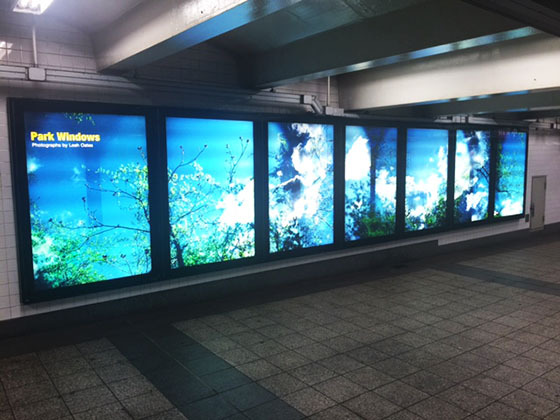 Artist Leah Oates curated the exhibit, which is on display as a panorama in the lightboxes at the north end of the 42nd Street- Bryant Park station. The added effect of the light boxes creates an other-worldly feel. According to the MTA, the photographs are part of a series called Transitory Space, where Oates takes photographs of outer-borough parks. She manipulates the film to create a feeling of time unraveling, and captures the photos at an upward glancing angle to give a sense of being there. Oates says she chose the parks because it's a place where nature "overcomes the urban grid and environmental obstacles to thrive." As a park in arguably the most urban part of New York, we can't relate more. In fact, in doing more research into her work, we were thrilled to find out that the particular photos featured below the park were shot in Queen's Jamaica Bay. As a supporter of the NYC Parks Department's Community Parks Initiative (CPI), we've been working to promote park equity in under-served communities through events and merchandising in our shop. Every dollar from the sale of NYC Parks branded merchandise is donated to CPI, which is supporting improvement efforts at Rockaway Community Park and Conch Playground, located in the same community where the photos were taken. Jamaica Bay through the lens of Leah Oates. We're not only excited that the exhibit brightens up such an enclosed space and brings more nature below the park, but that it's also featuring neighborhoods that we're actively working to support. The exhibit will be on view through mid-2017. You can check it out by visiting the 42nd Street-Bryant Park stop on the BDFM trains or the 5th Avenue stop on the 7 train.